Frida Kahlo’s artwork does not fit neatly into any box. Her work is highly biographical – out of 143 paintings, 55 are self-portraits. Her paintings often depict the physical pain she suffered as the result of polio and the 35 surgeries she endured following a horrific bus accident, as well as emotional pain resulting from several miscarriages and her tumultuous relationship with husband Diego Rivera.These vivid portrayals of suffering are punctuated with the bold colors and artistic style of Mexican folk art. Symbolically, “The Two Fridas” represents the harsh reality of an emotional state. 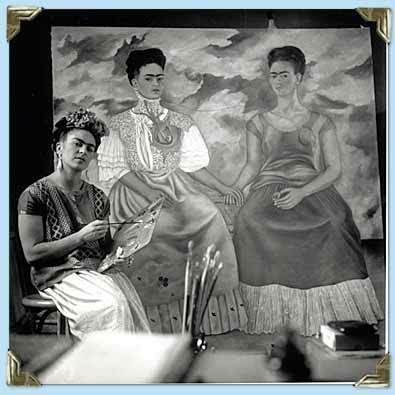 It was painted while Kahlo and Rivera were divorced. 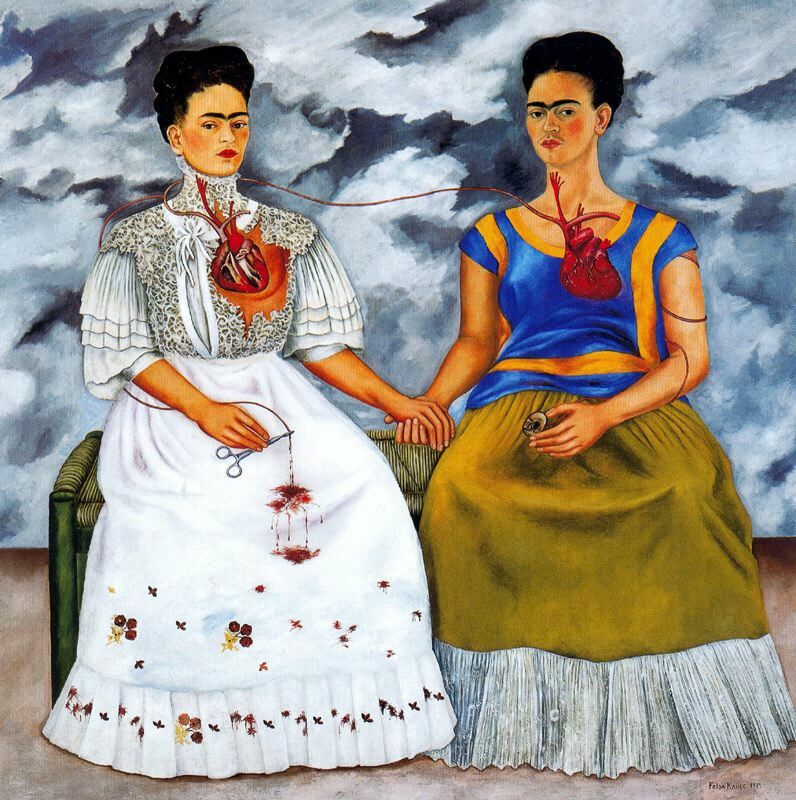 On the left, Frida wears a European dress ripped open, exposing her heart. On the right, she is clad in traditional Mexican clothing. Her heart is shown, but not exposed. The two Fridas not only hold hands, but also are dramatically connected at the heart. The European Frida clamps hemostatic forceps on the end of a bloody artery. 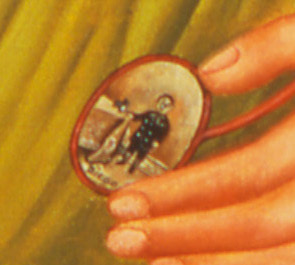 The Mexican Frida’s artery encircles her arm down to an image she is holding of Rivera as a child. It seems that the Mexican Frida is the woman Rivera loved, while the European Frida is the woman he divorced and no longer loves. In an attempt to file this work into the archives of art history, two movements suggest themselves: Symbolism and Surrealism. The symbols of the Symbolist movement were not the easily interpreted images of the past, but often had personal or obscure meanings. 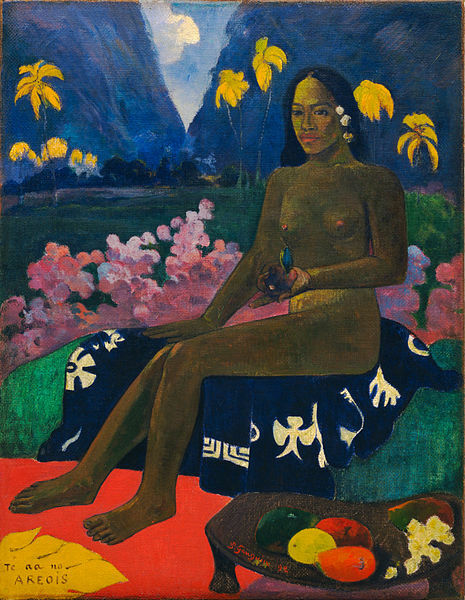 Gauguin was an inspiration to the movement, as “he wanted above all to convey character, to express the ‘inner thought,’ even in ugliness” (Theories of Modern Art). Symbolists wanted to convey feelings rather than just visual images. They claimed, “Works of a personal vision alone will live.” Although Kahlo fills her work with personal symbolism, “The Two Fridas” effectively captures the divided feelings and heartbreak anyone can relate to. 08 Mar	This entry was published on March 8, 2012 at 9:14 am. It’s filed under Art, Art History and tagged Diego Rivera, Edvard Munch, emotion, European, female artist, folk art, Frida Kahlo, Mexican, Paul Gauguin, Self portrait, Surrealism, Symbolism, Te aa no areois, The Two Fridas, ugliness. Bookmark the permalink. Follow any comments here with the RSS feed for this post.